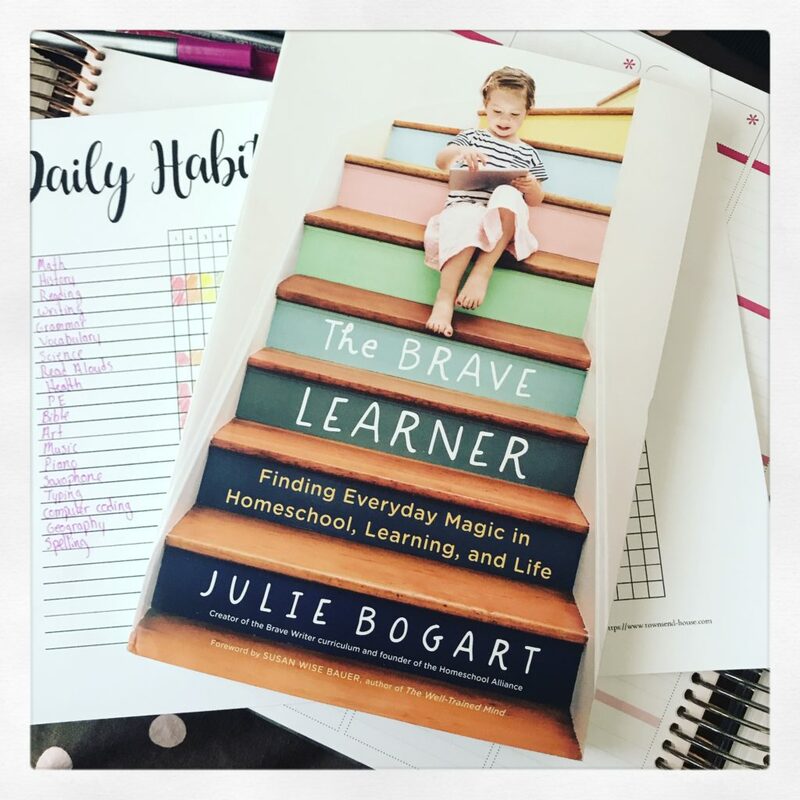 The Brave Learner: Finding Everyday Magin in Homeschool, Learning, and Life by Julie Bogart is one of those amazing books that you have to sit on for a while to really process all the information in it. That is exactly what I did. I actually first heard about Julie back at the beginning of 2017. I was trying to figure out how I could help Emma get better at spelling. It seemed like she could easily memorize words, but then when she was writing on her own, there were many mis-spellings. I am a pretty good speller, and so is my middle guy, so I wasn’t sure how to help her. Then I read something interesting on Julie’s website BraveWriter, that it takes 10 years for real writing fluency to kick in – that isn’t 10 years from birth. That is 10 years from when they start putting pencil to paper. What an eye-opening moment for me as a mom! Well, the reason that my 8-year-old wasn’t a great speller was not that I didn’t have the right curriculum, but rather that developmentally she was not at that point. Having someone give me permission to let go of some of my worries is a huge help as a homeschooler. We have taken on so much in educating our children ourselves, and there is no standard key to measure against. No longer are we measuring our kids across a wide range of their peers to see where they fall, instead, we measure them against themselves and there is no standard for that. My biggest reason for homeschooling? I want to create a love of learning in my kids. I’m sure it is the same for you. We see that everywhere – if we could just create a love of learning in our homeschool, we will have succeeded. What ends up happening is that we are constantly searching for the right curriculum to unlock that love of learning, when in reality our kids start out with that love before we even decide to crack open the first book. The Brave Learner as a lifestyle doesn’t stop at the end of the school year, it continues into the summer trips to the beach, nature walks, the library trips, even the video games – yes, she has an entire section on how video games can still be counted as learning! I realize that a lot of this information is a struggle to digest as a parent, especially a homeschooling parent. You are still holding onto that public school mindset, and until you can let go of it, it will be hard for you to transition your life into the Brave Learner lifestyle. The one thing that I really love about this book is all the resources and examples that Julie gives us. The ideas that you are able to explore after reading this book are immense. It starts right off the bat with Dotty’s art table – right in the middle of the house, accessible to all, and messy. The mess is something that I have struggled with when it comes to homeschooling (and honestly, parenting in general!). I want to give my kids access to the tools they need for the projects that they are passionate about, but the mess can be overwhelming. So then we look for systems to put in place in order to keep a handle on the mess, and yet still give our kids the freedom they need to do the work they love. We will be exploring this more next month when we talk about Environmental wellness. 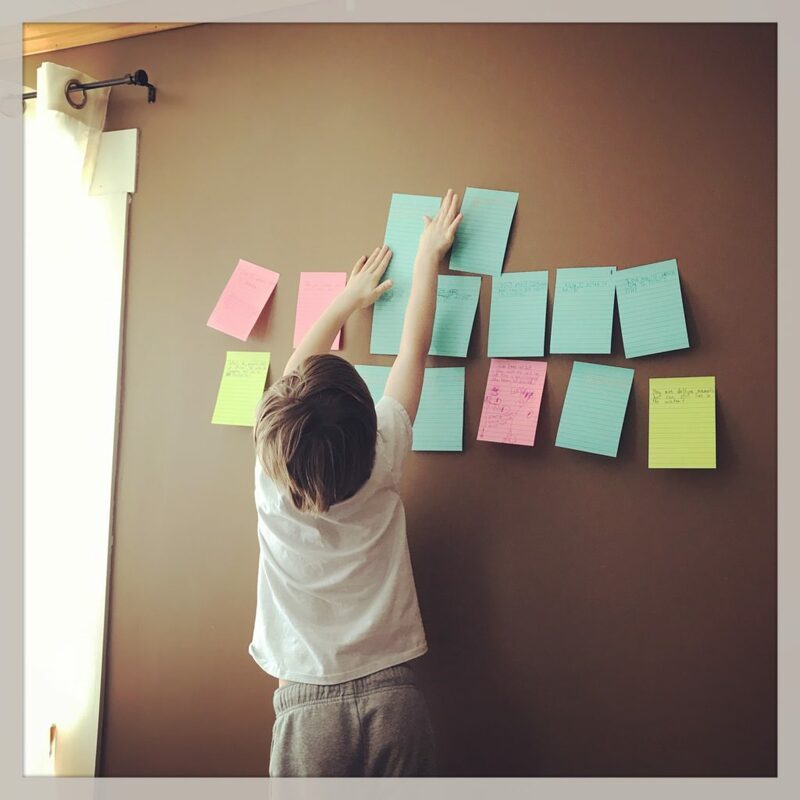 One of the favorite activities in the book for my kids was The Great Wall of Questions. For a week we had the kids write every question they had on a sticky note and put it on the wall. Every question. Something as small as “Can I have screen time now?” to “Who was the first magician?” Any and all questions were put on the wall. My kids took this task seriously, we ran out of sticky notes after one day, and I had to put in an emergency order for more! We are now using them as conversation starters, and enjoying the process of choosing a new question to discuss and sometimes answer – we still haven’t quite figured out how many people are named Tom, but eventually we may get there! This is an amazing book to have in your homeschooling library – in fact, I would say that it is an amazing parenting book in general. 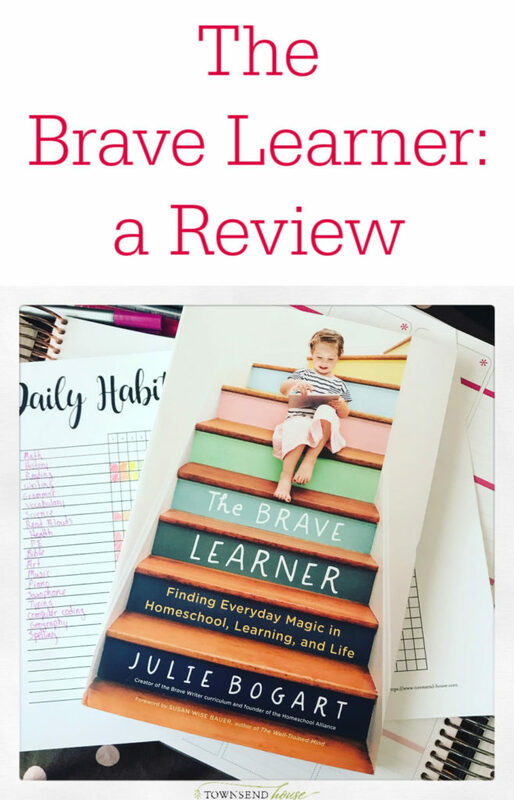 Even if your kids go to public or private school, the information that Julie lays out in The Brave Learner is applicable to your life as a parent. She delivers some great ideas about how to get kids interested in learning again. 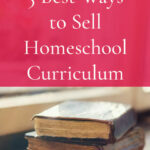 She explains ways to bring the magic back into your homeschool. There is permission when you can’t seem to get all the housework done. And mainly, a readjustment of expectations. What you should be doing vs. what you think you should be doing as a homeschooler. As a homeschool mom who has graduated five kids from homeschooling, Julie offers some guidance that we all are looking for. She is able to lay out all the different stages of homeschooling, right through to graduation and beyond, and that is a comfort when you don’t quite know what is next in your own homeschooling journey. I realized after reading this book that we have been living The Brave Learner Lifestyle since the beginning. To see that validation in book form is comforting in a world where there are no real standards to measure against. Homeschooling is so extraordinary, and not the typical environment that we are used to and to have some validation that we are doing something right is welcome. If you haven’t picked up this book yet, I highly recommend that you do. It is one that I have been referring back to since I got it at its release, and I will continue to refer back to as we move through our homeschool journey. Have you read The Brave Learner? What was your opinion of the book? Have you used any of her ideas in your own homeschool yet?